As the phrase goes The Kitchen is the heart of the home – this seems to be something that we hear more and more as cooking and entertaining now play a massive part in our everyday lives, whether its watching celebrity hosted cooking shows or TV programmes about food and its provenance – we have become a nation obsessed with food entertaining and of course the kitchen. The importance of this room often depends on the size available. In times gone by, kitchens were typically small rooms tucked away from the rest of the house and were used exclusively for cooking and were often hidden away to conceal the mess. How times change. Lifestyle influences arrived and now we have a very different take on what we want from the kitchen. Over the 40 or so years that we have been involved in kitchen design and manufacture, we have been presented with all shapes and sizes of spaces that are to become the new kitchen, from the smallest like this compact kitchen to the biggest such as this huge kitchen. But it’s never a problem and a challenge is always welcomed by the team here at Barnes. The beauty of our bespoke kitchens is that because they are hand made from start to finish we can customise every aspect to suit the space that you have available. Most of our customers have a fairly clear idea of what they want from their new kitchen before they come to see us and often they know the style they want to go for ranging from traditional or farm house kitchens through to more contemporary or modern kitchen design. Either way our team that includes in-house kitchen designers, draftsmen and cabinet makers can always conjure up a way to give you all that is wanted from the new kitchen. One of the biggest challenges in general is how to make the most of the space available to ensure that the kitchen works functionally but also provides the look and feel that you are looking for. With access to a huge range of materials, both modern and traditional we can always come up with ideas of how to use the space. Working with wood, stone and other natural materials our craftsmen are able to form kitchens to fit all types of spaces. Galley kitchens are often found in smaller properties. Typically a galley kitchen is narrow and ends with a window. We will often hand make wooden cabinetry that runs down each side and encompasses the kitchen appliances. 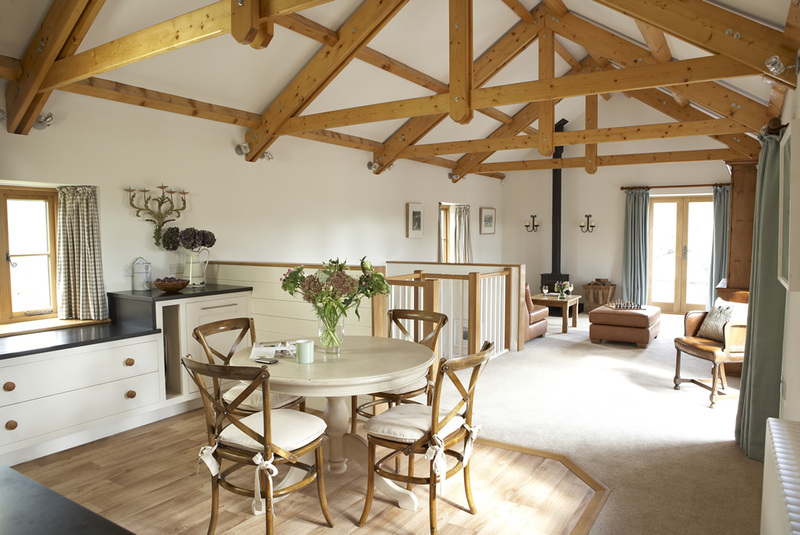 This helps to maximise the use of space and allows the room to retain a spacious feel. L-shaped kitchens are surprisingly popular and are often a result of knocking two rooms in to one. These kitchens tend to work well particularly if there are several people using the kitchen simultaneously. U-shaped kitchens are not uncommon and provide lots of space which allows separate areas to be created to divide the space up. 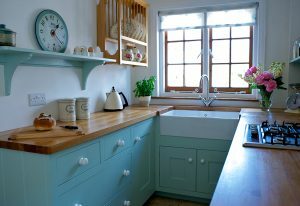 A mix of handmade wooden kitchen units and free standing furniture can work well depending on your choice of style and the age of the property. In smaller older properties we are sometime faced with a single line kitchen where there is only sufficient space to site the kitchen along one wall. We tend to site the appliances and sink in a way that allows the longest area of kitchen work top which creates the feeling of space. We can design the cabinets to house the appliances and maximise surface length and use wall units above for additional storage. Kitchen islands have long been a must-have in the kitchen and for good reason as they really do work by providing extra storage and space. 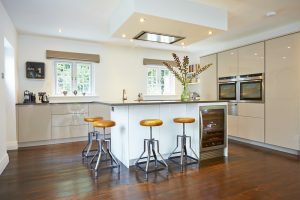 There are no real rules with kitchen islands as long as you can reach the centre with ease and don’t have to walk around it too often then it can be a real asset to a modern or a more classic kitchen. Finally a peninsular kitchen unit can provide a good solution to create more storage and valuable surface. Often used as a breakfast bar, peninsular units extend out at a right angle to give an L shape. Kitchens are ever evolving and what is wanted from them is changing every year. Our handmade kitchens are bespoke which allows us kitchen designers to stay ahead with the times and cater for these changes. 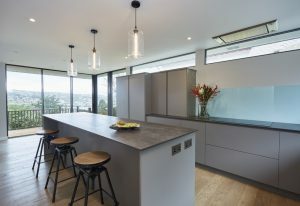 Today’s lifestyle is busy and varied and the kitchen functionality and design is changing to accommodate these changes. Appliances for the kitchen are also changing with new concepts and designs coming up every season. 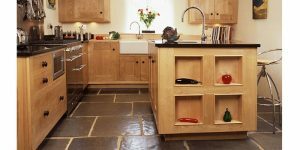 With the move towards more environmental friendly materials there is no better way to go than with a Barnes handmade kitchen which uses wood, stone and other natural materials which are in harmony with the greener lifestyles that we are adapting to. Remember whatever size and shape you have available there is always a solution and our experience here at Barnes allows us to present you with the options for you to consider. As always, we want you to have your dream kitchen, so from design to build and installation, we’re here to help.